YORK Theatre Royal, which last year won two prestigious York Design Awards following its £6million refurb, will host the launch of this year’s awards. The aim of the awards is to celebrate and promote the very best of building design in the city. The Theatre Royal was one of the big winners last year – picking up an award in the large non-residential category, and also winning The Press People’s Award, voted for by the public. More than 150 professionals from the property, architecture, building and development sectors are expected to be at the theatre next Wednesday from 6pm for the launch of this year’s awards. But the free event is very much open to the public, says York Design Awards chair Janet Hopton. “It’s very fitting to host the launch event at York Theatre Royal, which plays such an important role in the city’s cultural and tourism economies,” she said. The guest speaker next Wednesday will be London architect Bob Allies, who has worked on Kings Cross Central, Sheffield’s ‘Heart of the City’, and the Olympic Games legacy project. Winners will be announced and presented with their awards at the presentation evening on Monday June 25 at the University of York’s Ron Cooke Hub. This article is courtesy of The Press, please visit their website for more local news. Yorkshire and Humber goes from the slowest rate of rental growth in 2014 to 3rd / 4th fastest in 2016/17 respectively. 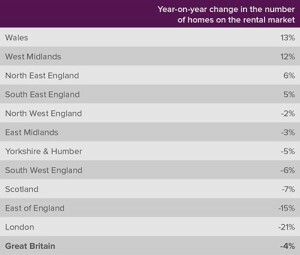 Rental growth across Great Britain picked up in 2017. Last year rents rose by an average of 2.4%, an increase from 1.8% in 2016 (table 1). 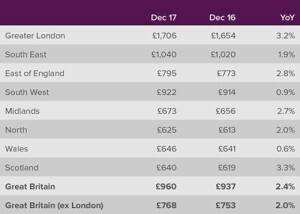 The average rent ended the year at 625 per month in the North (up by 2.0% from the start of the year, in contrast to £960 per month rise across UK (a rise of 2.4%). While rents rose a third faster than they did in 2016, rental growth was still behind than in both 2015 (3.2%) and 2014 (4.9%). Forty-six per cent of landlords increased the rent when re-letting their home, up from 37% in 2016. 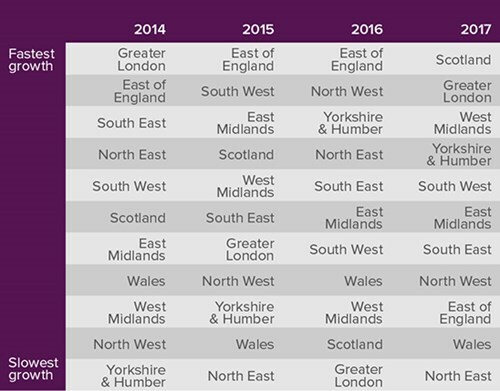 In a reversal of 2014 when Yorkshire and Humber had the slowest rate of rental growth in England, in 2016 and 2017 this had risen to having the 3rd and 4th fastest rate of growth respectively (table 2). 2017 also saw Yorkshire and Humber demonstrate its value for money for tenants in the rental market, replacing Wales as the sixth most expensive region of Great Britain to rent a home. Last year also saw a drop in the number of homes bought by Landlords. 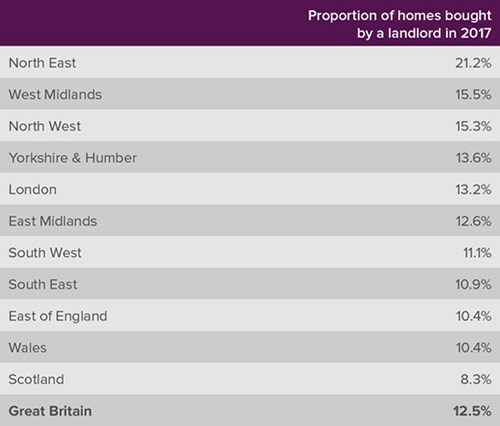 In 2017 landlords bought 12.5% of homes sold (table 3) in Great Britain, down from 14.7% in 2016, 16.3% in 2015. This represents a nine year low. 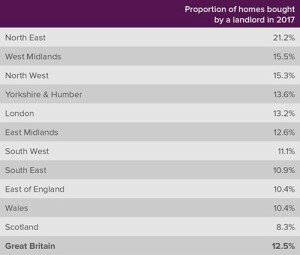 Between 2016 and 2017 the proportion of homes sold to landlords fell in every region, with a respectable 13.6% of homes in Yorkshire and Humber area being purchased by investors in 2017. The falling number of landlord purchases has meant the number of homes on the rental market has dropped. In December 2017 there were 4% fewer homes to rent across Great Britain than in December 2016, with Yorkshire and Humber showing a markedly lower fall of 5%, than that recorded in London of a 21% decrease (the largest of any region) (table 4). Despite the stamp duty hike inducing fall in stock, there were 5% more homes available to rent than there were two years ago. “Last year saw the rate of rental growth pick up to get closer to its long-term average. Most of the rise comes from a pickup in rental growth in London, after falls in 2016. 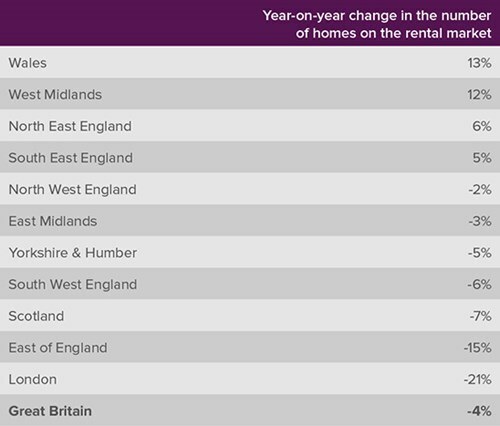 Rents rose across every region of Great Britain last year, although the north of England saw rents rise at a slower rate than they did in 2016.